I’m always looking to give my home and garden good energy by using plants and flowers in different ways. Easy enough to add a few drops of an essential oil to water and make a room spray but I wanted to make one with more attributes. So last weekend we were out gathering gorse flowers to make an essence in the ways of Dr Bach the homeopath. I went with what was beckoning on the Malvern Hills and it was the sunshine yellow gorse: lots of it on steep slopes requiring mindful picking away from the sharp spines. The harvest is wrapped in a cloth bag for the journey home. We collect some water from the Three Springs pipe in our glass bottles and imagine the petals floating in the water bathed in moonlight. The waxing moon sailed through thin clouds that night and her light was mostly milky. The next morning I filter and measure the infused water: one third water to two thirds brandy to preserve it. Next comes the dosage. For the room spray I use 4 drops of the flower essence in spring water along with 8 drops of essential oils: mandarin, niaouli (a gentler version of tea tree), black pepper and nutmeg. I’ll also be bathing my feet and hands in the spring water with 4 drops of flower essence each time, another traditional healing practice. Gorse flowers are used to treat feelings of uncertainty and anxiety, very much how I am; mother gorse obviously knows best. I spray it in the air and walk through the tiny droplets inhaling the sweet scents that recall breakfast on a garden terrace overlooking the sea somewhere in North Africa. 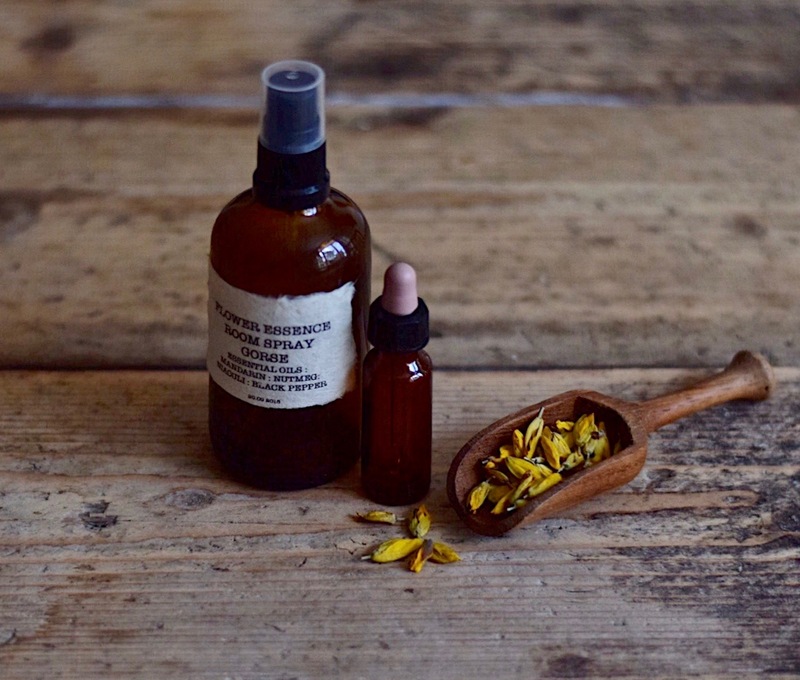 Love and thanks to my daughter Luci whose training and practice in botanical therapies I have drawn on to make the flower remedy. If you use flower essences yourself I’d love to hear from you; please comment in the box below. I’ll be writing about how I’ve found the gorse essence and taking you through a new one in my November newsletter.